I’ve heard people who own pets live longer than those who don’t. Me, I’m all about living longer. I don’t know about you, but I have way too much to do. I figure I’m ahead of the game, too, since we already have a cat. And not just any cat, but a smart, playful, snuggly cat that sleeps on top of my head every night. I think my husband, the cat person in our family, was jealous because as cuddly and wonderful as the cat is, we decided it wasn’t enough for us and added this gorgeous Samoyed to our family. We got him from the local shelter, which means he’s already trained! He does his business outside, can sit, lie down, roll over, wait, beg . . . and bark whenever he wants. We’re still working on that last one. He chases the kids, hangs out at my feet while I write, and generally scares the cat all day long (because big hairy dogs lying passively on the floor are terrifying). Oh, and did I mention the walks? Next time we talk about getting a sled dog, someone please remind me about the walks. I’m still trying to merge my writing schedule with his walking schedule. I take more breaks now, but I think I’ve added at least ten years to my life. Good trade-off, don’t you think? I’ve bought myself time to write at least ten more books =). 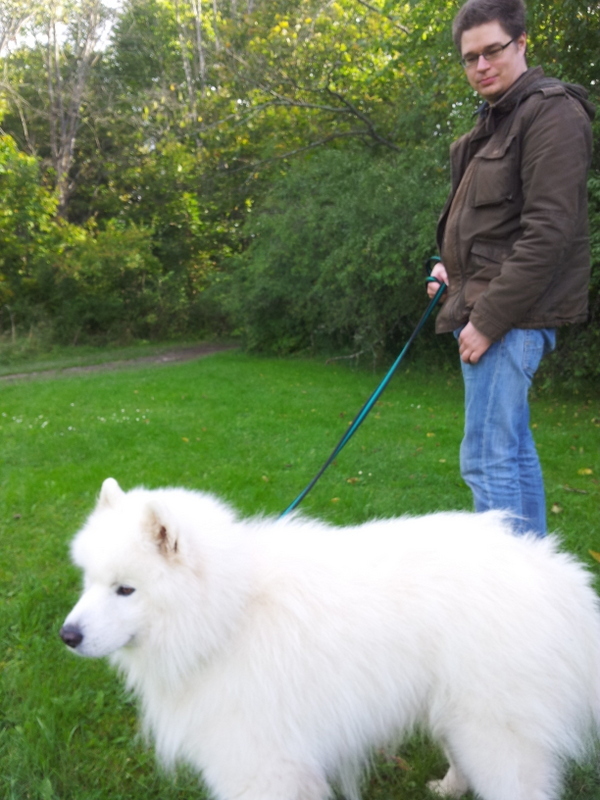 Samoyeds are gentle, intelligent and quiet friends. The ones I have known were wonderful dogs, patient and watchful of children, small women and the elderly, herding and protecting them from harm. They are very strong and powerful, and only barked when they had to… A breeder I knew like to tell a story about how an armed burglar broke into a Samoyed house and the family didn’t know a thing until the burglar starting screaming! The dog didn’t make a sound until he locked his teeth on the man outside the five-year-old’s bedroom and thereafter a hundred pounds of canine convinced the gentleman to play nice for the twenty minutes it took the police to arrive. 😉 Enjoy your new friend! Ha! What a great dog! It’s funny, because a lot of times that’s where I’ll find Atlas resting, just outside the five-year-old’s room. Maybe they instinctively want to protect the young ones =). A cute dog and a longer life to boot. Sounds like a good deal to me! 😀 Atlas is a great name, too.